If you didn't know yesterday was the Super Bowl game (if you didn't I'm guessing you live under a rock). One of the appetizers I made for the game were Bennigan's Broccoli Bites. Bennigan's is a restaurant that is now closed that I used to go to back in the day. They had on their menu Broccoli Bites , they were SO good I swear I ordered them every time I went there! Now these are close but not 100% the same as Bennigan's. 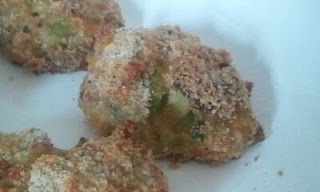 I used my food processor and pulsed a few times the broccoli to get it a good consistency, you do not want any large pieces, you want them fine but not to fine. In another bowl beat your eggs, set aside. Serve with the honey mustard!